The Cubs got their collective face punched in today, but Kris Bryant hit a ball 440′ to dead center, and he knew he got it. That’s easy power, and it’s very exciting. February 28th Cubs Preview; Lineups, Etc. 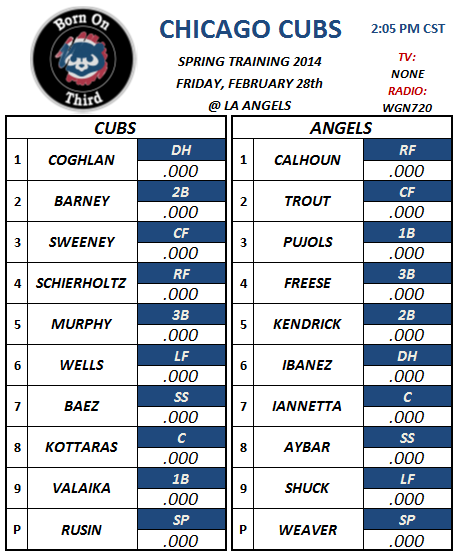 The Cubs travel to Tempe today to take on the Los Angeles Angels, who will be making their 2014 spring training debut. The Cubs are coming off a 5-2 loss to the D-Backs yesterday, and are ready to trot out a completely different lineup today. Chris Rusin gets the start for the Cubs and he will be opposed by Angels ace, Jeff Weaver. Javier Baez makes is long awaiting 2014 debut hitting 7th, and playing shortstop. No TV today, but the game can be heard on WGN72o beginning at 2:00 PM CST, go Cubs! Author bornonthirdcubsPosted on February 28, 2014 Categories 2014 Spring TrainingTags Albert Pujols, Angels 2/28/2014 lineup, Chris Rusin, Cubs 2/28/2014 lineup, Javier Baez, Jeff Weaver, Mike TroutLeave a comment on February 28th Cubs Preview; Lineups, Etc. Off and not exactly running for the Cubs as they fell to the Diamondbacks this afternoon 5-2 in their Cactus League opener. The star of the show today was the debut of new Cubs Park in Mesa, by everyone’s account it is the best Spring facility there is for the players and fans. Jeff Samardzija got the start and was a little too amped up as he walked the first batter of the game on four straight pitches. Samardzija settled down after that, and had a rather solid spring debut against a stout Diamondbacks lineup. Shark worked two scoreless innings giving up two hits while walking one, and striking out two. Starlin Castro looked really good at the plate on a day when Cubs hitters were anything but comfortable. On the day, the Cubs had five hits as a team, Castro ended with two of them. He finished the day 2-for-2 with a double, and an RBI. Two of the newest members of the Cubs bullpen struggled today, as both Wesley Wright, and Jose Veras were beat up. Wright, who took the loss, worked one inning giving up three runs on two hits while striking out three. Veras worked an inning, giving up two runs on two hits while walking one and striking out one. Hector Rondon, and Justin Grimm impressed out of the bullpen today. Grimm touched 97 on the gun while working a scoreless inning. Rondon also worked a scoreless inning, and struck out the side in doing so. The Cubs will travel to Tempe tomorrow afternoon to take on the Angels beginning at 2:05 PM CST. Spring Training is Here; February 27 Preview, Lineups, Etc. Finally, Spring Training is about to begin. The Cubs open their brand new facility in Mesa, and the 2014 Spring schedule tomorrow afternoon against the Diamondbacks. Jeff Samardzija gets the start amid trade rumors that are still swirling given the perceived stalled contract negotiations between him and the Cubs. The Cubs will be opposed by Bronson Arroyo and a power laden D-Backs lineup that was bolstered in the off-season with the acquisition of Mark Trumbo who will play LF for Arizona tomorrow. Here are the lineups, and the extra pitchers that both teams will be carrying. For the image impaired that are reading, the Cubs plan to use Wesley Wright, Alberto Cabrera, Justin Grimm, Pedro Strop, Blake Parker, Hector Rondon, and Jose Veras in addition to Shark. The game begins at 2:00 PM CST, and will be televised (!) on WGN. Author bornonthirdcubsPosted on February 26, 2014 Categories 2014 Spring TrainingTags alberto cabrera, Blake Parker, Bronson Arroyo, Cubs February 27th lineup, Cubs new Spring Training facility, Cubs open Spring Training, Diamondbacks February 27th lineup, Hector Rondon, Jeff Samardzija, Jose Veras, Justin Grimm, Mark trumbo, Pedro Strop, Wesley WrightLeave a comment on Spring Training is Here; February 27 Preview, Lineups, Etc.